I don't think we should have any disagreements. I shy away from politics in this project, and nothing I've posted should be debatable. As you can see from the history in the earlier post, the only thing I really even touch on with modern history is what I need to touch on in order to explain the recent population shifts. I'm going for realism, inasmuch as I can. Expulsion and emigration have prevented population growth in post-1948 Israel and Palestine. Today, estimates of 75,000 are generous, though another 175,000-190,000 can be found in the diaspora. There should be nothing controversial with that. Nope. They much less populous than the Palestinians. I'm guessing that they are a minority and Palestinians also exist there. Well, they're a subset of Palestinian. That is, they identify with the Palestinians and the Palestinians consider them one of their own. This is unlike, say, the Armenians, who have lived in the area just as long but never identified themselves with the Arabs. With that said, the Palestinians are not homogeneous and never have been. (In fact, that tends to be the primary argument for people who deny that there exists any such thing as a 'Palestinian people.' Or, at least, it's their strongest argument). A similar case might be in the West Syriac population, which fully assimilated into Arab culture centuries ago, and whose descendants are undoubtedly Palestinians, but remnants of their cultures and communities are still present. The Sebastic example differs not in lack of assimilation with the Arab population, but in that the community has retained more of its culture, including its language. Again pointing to the history post, although not really spelled out in that post, this is actually a general trend in the 'quietist' Sebastic community's history. In the past, they've identified as Israelites. Sometimes their Israelite religion was considered a sect of Samaritanism, though it's unclear if this meant community members were identifying themselves as such or if outsiders were identifying them as such. They probably associated with the Syriac nation, whatever it was, throughout most of the first millennium. I've imagined their identification with the Arabs as having its beginning in the 18th century, with solidification of that identity during the Nahda movement. I've always been unsure about that, since their bilingualism with Arabic would stretch back to somewhere in the range of the 10th century to the 12th century. But I think it would help explain their retention of culture longer than that of the West Syriac speakers. In the 20th century, they would have experienced the "rally around the flag" effect that the heterogeneous, native communities of Palestine pretty much all experienced, save those communities of Palestinian Jews who were caught in the middle. Like most of these heterogeneous communities, they would retain local traditions while also embracing the symbols, values, traditions, and solidarity of the Palestinian nation, most of which only became pan-Palestinian cultural objects in the past century. Hope that clarifies how they fit into the modern situation. I doubt that they would identify as Syriacs or speak Sebastic if they were real Israelites. I recommend making them have a a non-Abrahamic monothiestic faith (perhaps historically related to the Abrahamic ones with obvious later Samaritan influence). If they speak another language other than Arabic (even along with Arabic), I wouldn't buy them as having an Arab identity. They might identify as being Palestinian nationals without Palestinian ethnicity. That seems silly. They do speak Arabic as a bilingual community. Syriac-speaking communities in Lebanon and Syria (almost non-existent today, but were once larger) have long identified as Arabs. The equivalent doesn't exist in Palestine, only because Syriac died out there already and there were no bilingual communities. You need to start presenting your cases better. You're challenging what I have done, but without detailing any argument as to why. Do you know what would have made Syriac identity in 7th century Palestine, for instance? If you do, then say why you have a hard time seeing that work. For me, it seems Syriac identity is tangled up with a mixture of identification with Syriac literati and an opposition to Constantinople. In fact, it seems to me that the identity might be removed from language. This is all debatable, of course, but you're not putting up any sort of debate. The argument that they wouldn't speak Sebastic if they were "real Israelites" makes even less sense. The area was famously not linguistically homogeneous. At best, the area was conceived of as a dialect continuum, with no concept of equating a particular dialect with an entire kingdom. Finally, the most perplexing is the suggestion that they should have a non-Abrahamic monotheistic faith. For one thing, I have a hard time conceiving of the religion of the Kingdom of Israel as monotheistic, at least in the sense of having only one god. At most, it seems to have been monotheistic in this period in the sense of having a local preference for one specific god. But what's more, this period is quite clearly a fragile time for religion in the region. In fact, religion seems to correlate with political allegiance. The Abrahamic faiths are only in this period becoming centralized, by way of state-enforced sacrifices at only the temple of the capital. This leads to two main Abrahamic religions: what-would-later-become-Judaism centered in Jerusalem, and what-would-later-become-Samaritanism centered in Shechem. That the Sebastic community would have had their own comes from their political strength within the Kingdom of Israel; that it would be Abrahamic comes from their political allegiance to the Kingdom of Israel. I'm fully open to suggestions, critiques, and general feedback. And I hope my defense of anything I've done doesn't come off snarky. I really do appreciate feedback. But if you're going to tear apart what I have done, you're going to need to explain why you think that way, especially if your feedback happens to line up with a modern ideology. I tend to agree with Methru about them not identifying as ethnic Palestinians. The Chaldeans first come to mind. They are (largely) Iraqi in nationality; speak Arabic and Aramaic; practice Christianity and identify themselves as a ethnically Chaldean. I think the case you've made for them identifying as ethnically Palestinian is plausible, don't get me wrong. I just lean toward them identifying as a separate ethnic group as being more likely considering all that does separate gen from thei Palestinian neighbors. Edit: I wrote this before I saw your response to methru. It's a problem if you have to go all the way to Iraq to find an example of a community that spoke Arabic but remained distinct in identify from the Arabs. With all that said, this is not a thread on Palestinianness or identity. (You're welcome to open one up in Ephemera, if it pleases you). I'm not interested in this aspect at all, which was a controversy introduced by methru. Let's leave it out of this thread, and focus on the linguistics, please. I feel the thread is in danger of being hijacked. Edit: Ah, OK. I just saw your edit. What about the Assyrians/Arameans/Syriacs (terms which can sometimes be synonymous with "Chaldean", or as different ethnicities)? They exist in Lebanon, Syria, Iraq and some have moved to Israel. As you said, many of them identify as Arabs. There are, however, many others that do not. The Maronites in Israel specifically requested a separate Aramean category rather than to continue identifying as Arab Christians. Other Syriacs in Lebanon identify as Phoenicians, Assyrians or Arameans in direct opposition to an Arab identity. But Sebastic is not part of the dialect continuum, as it is not a Canaanite language. True Israelites would probably start speaking a Canaanite language. This makes more sense. I feel like the idea of a Sebastic language surviving into modern times is unlikely, however. They would adopt a Canaanite language for rituals. Sebastic could continue as a non-ritual language, but it would be subsumed by Arabic in that realm during the Medieval Era (like many Syriac communities and all Samaritan ones). And I hope my defense of anything I've done doesn't come off snarky. By monotheistic, I kind of meant a sort of Judaic-style gradual evolution into monotheism. I think a non-Abrahamic religion that was heavily influenced into a similar monotheism is the best hope for a Modern Sebastic. Such a community would likely develop into its own ethno-religious group, like Samaritans, Druze or Jews. In fact, even if it became an offshoot of the Jewish faith similar to Samaritanism, it would still evolve into a separate ethno-religious group. I feel like your problem is that you are drawing the wrong conclusions from the right examples (Syriac and Samaritan). You probably feel like I am doing the same . I'm putting a stop to the identity discussions. See above. I think I understand what you're saying about a non-Abrahamic religion, maybe. It is definitely meant to have Sebastic elements and traditions imported from their former faith, and they have scriptures written in Sebastic. (One psalm from their scriptures is given above). There was a clear, concerted movement to make proto-Samaritanism their own. In fact, the central figure of the Sebastic religion was Elias, who is said to have converted them. One of their scriptural works, The Chronicle of Elias, expounds on how they were worshipping other gods, felt abandoned by them, and Elias gave them proofs for the worship of YHWH, which had formerly been rejected by the community. Elias himself was from the community, and he framed the religion as compatible with the Sebastic traditions. Conveniently, as so happens often with religious conversions of communities, the Sebastic community, which formerly had sour relations with the Kingdom of Israel, was looking for ways to ally itself with the Kingdom of Israel against invaders from the north, without submitting their entire culture. So, the conversion to an Abrahamic religion was a political move, and it's not intended that they had an Abrahamic religion originally. Okay. You pretty much answered my question to satisfaction anyway. Pre-Classical Sebastic refers to Sebastic writings that predate the Sebastic literary period. The language appears to be characterized by the following features. -Lack of NC stems. ND stem either unclear or non-existent. -Some, but very limited confusion of vowels, indicating lack of phonemic /ə/ but probable vowel reduction for /u/ (centralized unrounded allophone of /u/) in propretonic positions. -Written in Phoenician abjad, cuneiform, and Egyptian hieroglyphs. The earliest writings of Sebastic in Canaan are written in cuneiform. Like Phoenician but unlike Egyptian hieroglyphs, cuneiform continued to be employed into the early Classical period. The reason for writing Sebastic in cuneiform is still uncertain, and was an anomalous phenomenon. International correspondence was conducted in Akkadian, and letters between Sebastians were typically recorded in the Phoenician script. The types of documents written in Sebastic cuneiform are primarily administrative records, court documents (including contracts supervised by a court), private scribal notes, and magic inscriptions. Commonalities between these documents seem to be frequent, everyday business associated with municipal governance or oversight. They are further characterized by the lack of wide accessibility to cuneiform, giving select individuals the ability to read or forge documents. The prevailing theory is that Sebastic cuneiform is a product of local centralization of government, but in a more economic and less expensive manner than Akkadian cuneiform. According to this theory, far more scribes were available to write in cuneiform than there were scribes who knew Akkadian. After mastering the cuneiform and having experience as a scribe, some scribes would have the opportunity to learn Akkadian. 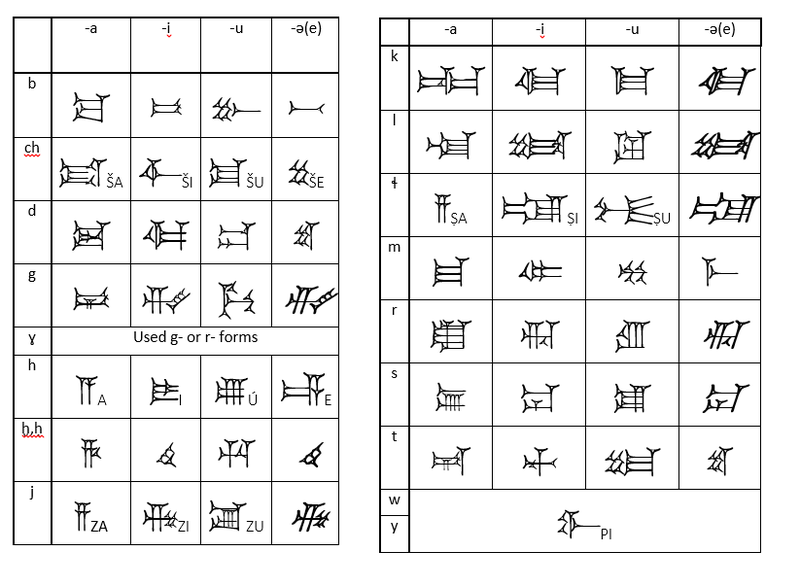 During the learning stage, they would gradually replace Sebastic with Akkadian. This is attested by the existence of private scribal notes and magic inscriptions in Sebastic cuneiform with varying levels of Akkadian interference, while there is a near total lack of mixture in administrative records or court documents. Scribes who knew Akkadian would then be employed only for documents with international implications. 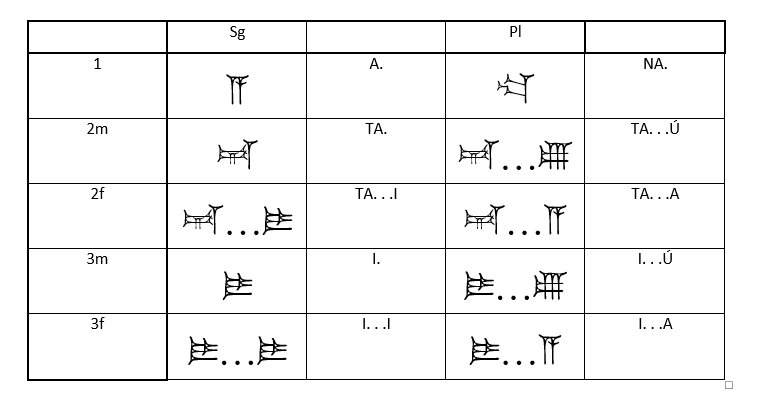 By the Classical period, the cuneiform syllabary appears to have simplified for writing Sebastic. With few exceptions, syllabograms were biphonemic, representing either CV or VC syllables. Syllabograms for hV could be used to represent vowels independently. In cases of CVC syllables, two syllabograms would be used to represent the syllable: eg, sa-ak for sak. While vowel length was not evident in this system, it did distinguish gemination: sa-ki-im for sákim, but sa-ak-ki-im for sákkim. Since stress was phonemic in Classical Sebastic, later cuneiform texts would often distinguish ambiguous cases by adding a vocalic syllable into the word: ja-sa-a-ak-ki-im for jasákkim and ja-a-sa-ak-ki-im for jásakkim. 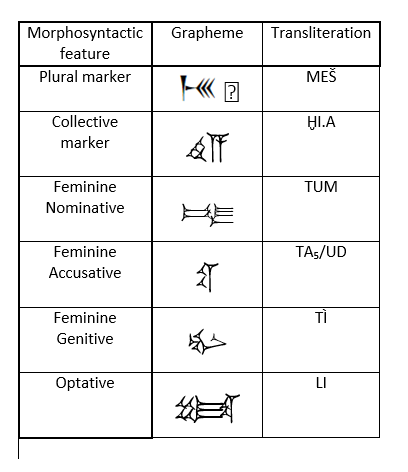 Many Akkadian (=Sumerian) logograms were preserved. Only a handful of Akkadian determinatives existed. Personal names and city names tended to use determinatives. In an odd in-between, names of countries spelled out the Akkadian word ma-a-at, and treated it as a determinative. An interesting feature of Sebastic cuneiform is its employment of Akkadian morphosyntactic markers, including for features not present in Sebastic. Likewise, Sebastic cuneiform was written in SOV word order, while Sebastic naturally tended towards VSO or Subject-Predicate word orders. Plural nouns were not written as broken plurals. Instead, the singular noun was used, followed by a plural marker. A collective marker was used also for collectives. Even though Sebastic never had cases, case tended to be marked, and was included in the feminine marking of feminine nouns. For masculine nouns, case was marked with the final syllabogram, which would end with -u (nominative), -a (accusative), -i (genitive). Case would often be marked wrong. In plural nouns, case would be marked prior to the plural marking. Verb conjugations tended to be written morphographically. I'm thinking about introducing ergativity into the language, to work out a certain problem I'm having. I'm a bit unversed in ergative languages, though, and am hesitant to work with something I know so little about. So perhaps those of you who are more familiar may be able to help me. But some verbs that are formally or etymologically intransitive can secondarily take objects. Is it possible to keep the absolutive case the agent of a formally intransitive verb when it becomes transitive? Or does the ergative absolutely have to become the agent? Last edited by tiramisu on Sat Mar 17, 2018 8:56 pm, edited 3 times in total. The "transitive" version's second mandatory argument (assuming it is truly mandatory) could simply not be ergative? That is the verb is not syntactically transitive, but its meaning still change, so you have an absolutive subject and an "object" in, say, the dative. So I would need to both make the agent ergative (although it remains formally intransitive) and add the preposition explicitly? I'd like to make sure I get this right. You want a construction where a verb which is normally intransitive with an absolutive subject acquires a second argument without the subject changing case, right? Markingwise, you have several options. Maybe the argument added is in the dative, the genitive or even a case specific to this situation (any of the non-verb linked cases, really...), or otherwise brought in via a preposition. Bivalent verbs and constructions where the nonsubject, mandatory argument isn't a syntactic object are perfectly legitimate. French aller has a mandatory second argument which is a locative, hence J'y vais / je m'en vais "I'm leaving", lit. "I'm going", specifically "going there/from here" because the extra argument are mandatory (to the point of showing up even when the object is expressed formally: je m'en vais d'ici). This does not necessarily requires a marker on the verb if it's a standard construction: it's pretty much an ambitransitive verb of the same type as English eat, except with the "object" in a case that doesn't correspond to a typical object's case. Nothing prevents a marker (applicative?) on the verb ton indicate the construction, either. is perfectly valid a way to achieve this, but my answer above assumes this isn't what you wished for. Sorry about the late response, on my own thread... it's testimony to how busy I've been and how little I'm checking the board these days. Likewise, my apologies for my earlier posts, both of which were written in a tired state and were all mixed up. (I edited them and fixed them before your last response, but just in case that contributed to any confusion...). There is such a thing as an ergative verb, where the intransitive subject of an ambitransitive verb is equivalent to the transitive object of that verb. I presume these are more common in ergative-absolutive languages than in nominative-accusative languages, but I could be wrong (after all, English has a number of ergative verbs despite being nominative-accusative).